Bari is a charming city in the South of Italy. The fertile land of olive trees and winery is known as Puglia. Bari is a port on Adriatic coast. This city offers a great number of interesting sights for travelers. Bari is a city with two faces. Ancient northern district contains real gems. It is known as Citta Vecchia. Another district is elegant Murat area with numerous shops and a promenade on the sea. It is the New Town. On the east there is an old port where fishermen still sell their catch in the mornings like centuries ago. In Bari a traveler can find real masterpieces of architecture and history. 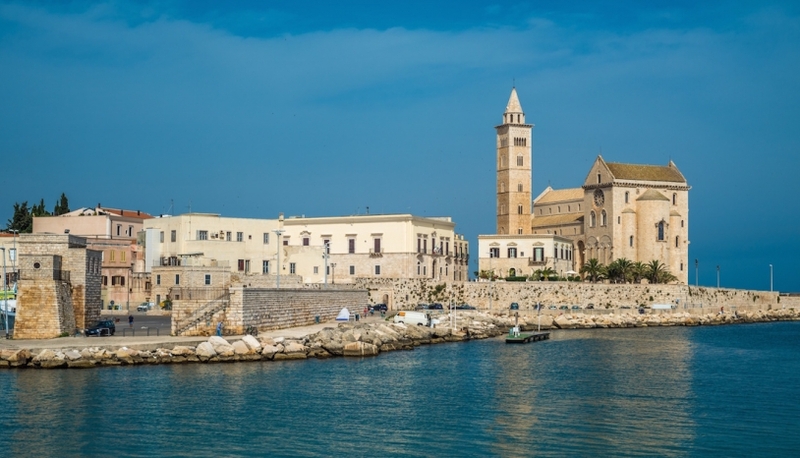 Ancient heart of the city is spellbinding area of Bari Vecchia. It transfers a visitor back to the Middle Ages. This district consists of narrow streets and lanes crossing each other. Here you can feel a unique atmosphere of Italian style of life. It's a pleasure to walk in this picturesque district, loose the way in the labyrinth of small lanes, visit tiny shops and trattorias, have a glass of beer in the numerous pubs. A massive building of Castello Svevo is the main medieval fortress. Thick walls are crowned by two towers. 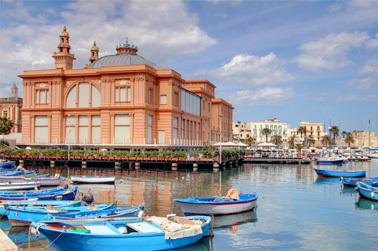 Today it is an exhibition center of Bari. In Bari Vecchia you can find real masterpieces as Basilica Di San Nicola. It became a symbol of Bari and a destination for pilgrims of both Catholic and Orthodox Church. A splendid example of Puglia Romanesque style the cathedral strikes visitors with gilded wooden ceiling. The Cathedral of San Sabino is the main church of Bari. Originally built in Byzantine style it is named after Bishop San Sabino. The facade strikes with a wonderful rose window. It is impossible to miss main squares in Bari Vecchia. Piazza Ferrarese is nice and cozy with many small shops offering home-made pasta. It is a pleasant place to have some rest with drink and watch people walking by. You feel the atmosphere of life in the Old Town. Piazza Mercantile is the hub of the city life. A column with a lion figure attracts attention on the square. It is known as Column of Justice. In the Middle Centuries debtors were brought here, tied to the column and whipped. Fashionable Murat district is known as the New Town. It boasts not only numerous shopping streets, but also elegant palaces and theatres such as Teatro Petruzzelli, Teatro Piccinni and Palazzo Fizzarotti. Bari offers for the guests not only sightseeing, but also pleasant walking along the sea coast, shopping, bright nightlife and, certainly, delicious food. Bari's cuisine is very traditional and popular. Homemade pasta, tomatoes, olives and, of course, fresh fish and seafood will please any gourmet. There are a lot of things to do in Bari during any season. Modern entertainment and great historical heritage wait visitors in this charming Italian city.